This article has been submitted by a user. Unfortunately he is not able to verify that the example is running. Therefore it cannot be considered as working. Ths project implements a Microblaze Soft Processor with a “Hello Wold!” example software running on it. 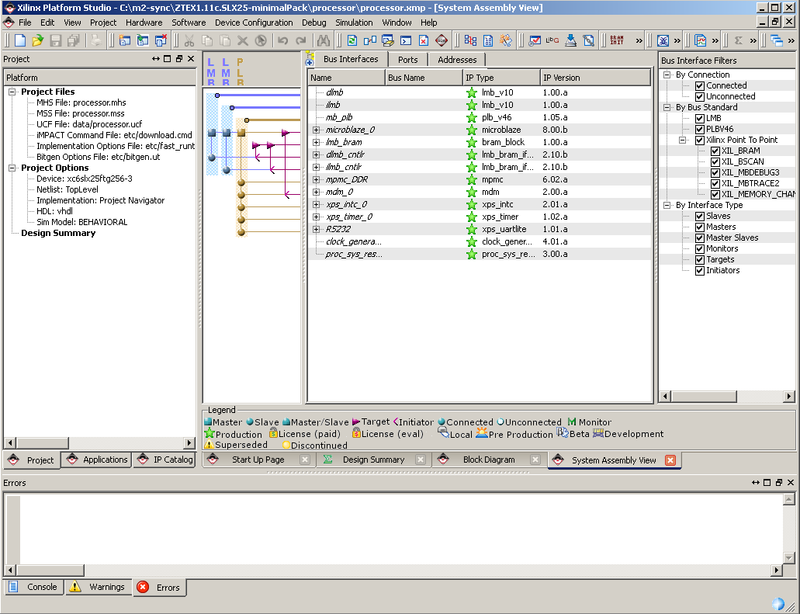 It was tested on successfully on ZTEX USB-FPGA-Modules 1.11c. The project sources can be downloaded by clicking on tho following link: Microblaze Hello World Example. License requirements: you'll need Xilinx EDK license (not free one) to be able to use XPS/SDK components, ISE require WebPACK license (free one). FPGA board specific constraints are defined in resetClockTrace.ucf (reset and clock signals) and ddr-sdram-simon.ucf (DDR SDRAM signals). 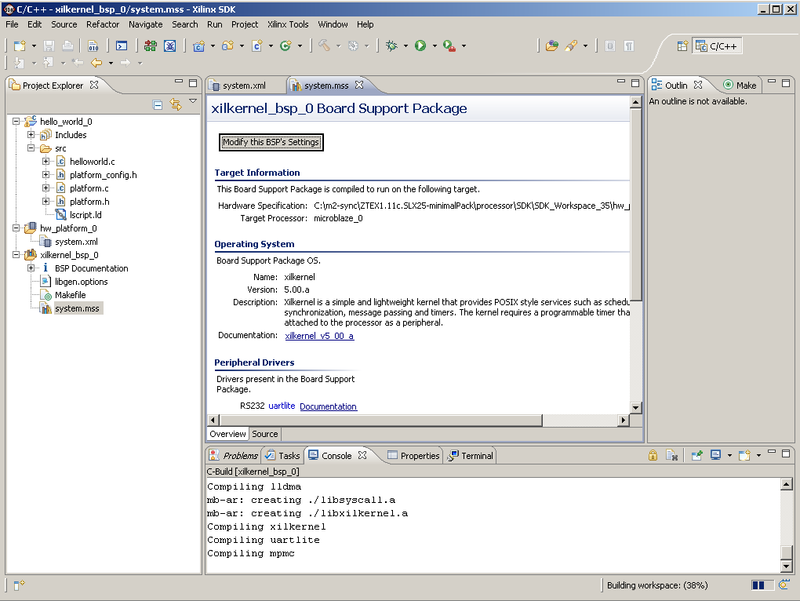 The Microblaze soft processor core was generated using the ISE/XPS “embedded processor” Wizard (configuration stored in processor/processor.mhs). 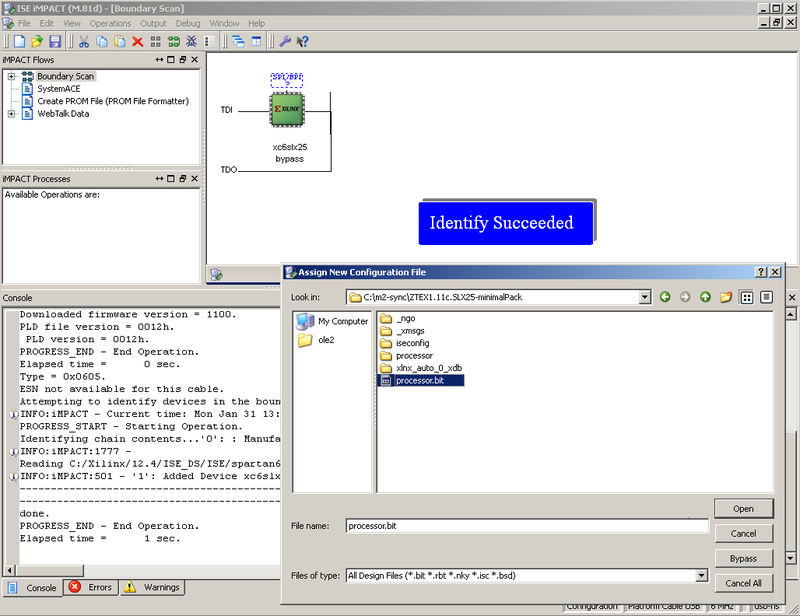 The software is defined in processor/SDK/SDK_Workspace_32/hello_world_0/src/helloworld.c. At startup the XilKernel is launched and a static thread sending “Hello World” to default UART port configured at the moment “embedded processor” is created. In order to implement the design just open ZTEX1.11c.SLX25.xise project file, select “processor” entity and double click on “Generate Programming File”. 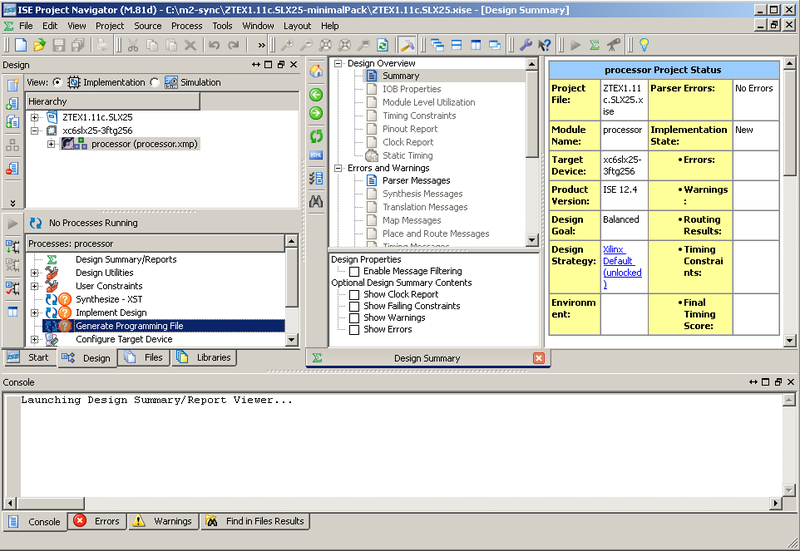 From ISE project page double click on processor.xps file in order to launch Microblaze designer (Xilinx Platform Studio). XPS will provide all components connectivity within PLB bus and external pins management. From XPS project page choose top menu Project→“Export Hardware Design to SDK in order to launch Microblaze SDK (Eclipse based environment). SDK will provide all software integration including HAL definition (hw_platform_0) and BSP functionality (xilkernel_bsp_0). 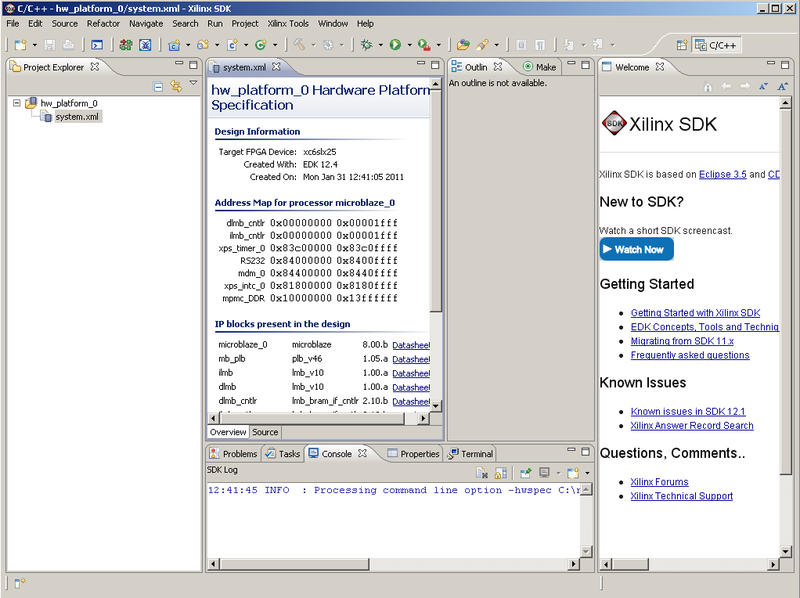 or the Program FPGA dialog of the Xilinx SDK. In order to run or at least to program .elf into the board bootloop.bmm (aka edkBmmFile_bd.bmm) must be uploaded first into BRAM block. 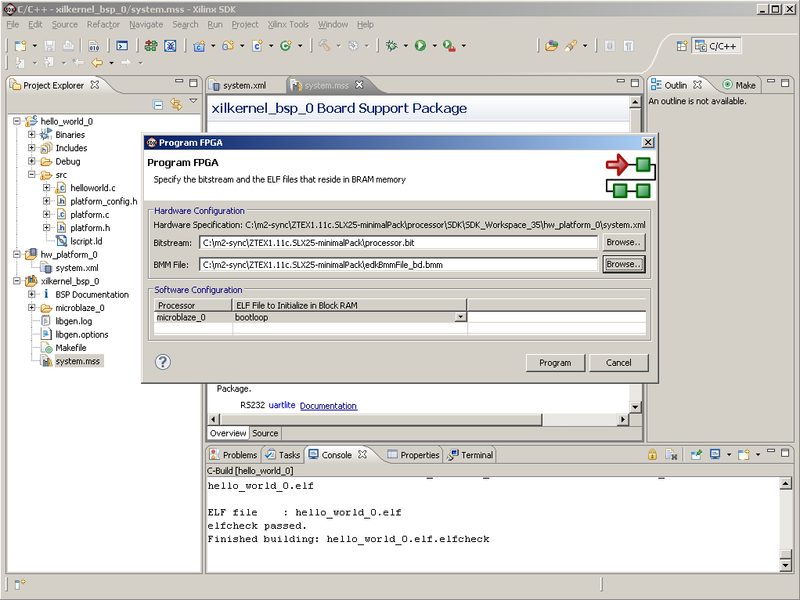 This bootloader accept .elf binary delivered by JTAG interface and provide necessary environment for correct launch it. It is also possible to include bnm files (that are files are BRAM images) into bitstream using he data2mem tool from Xilinx (<bit file> + <bmm file> = <new bit file>, where <new bit file> can be uploaded directly using FWLoader.